Waikiki Park Heights #1806 - Ocean View, 5 min. walk to beach, central A/C! Sleeps 3. Ocean View, 5 min. walk to beach, central A/C! Sleeps 3. You’ll appreciate this cute one-bedroom condo with ocean views and central AC! Your "home away from home" is 488 sq.ft. plus the 60 square foot balcony/lanai (with table and chairs). - Cutlery, cooking utensils, dishes, glassware, and a large selection of pots and pans! Sorry, no pets. This non-smoking accommodation sleeps 3. - 4th floor Sundeck has heated saline pool, lounge chairs, and tables with umbrellas. As this was our 15th consecutive year staying at The Waikiki Heights our review probably speaks fro itself. Mahalo and Welcome back! Thank you for choosing to stay with Captain Cook Resorts, we appreciate your repeat business and the great review and recommendation! We're so glad your visit was enjoyable and look forward to seeing you again. First visit to Honolulu. Waikiki the highlight and this property as advertised. No complaints. Close to most attractions. Mahalo for the review, Helen! 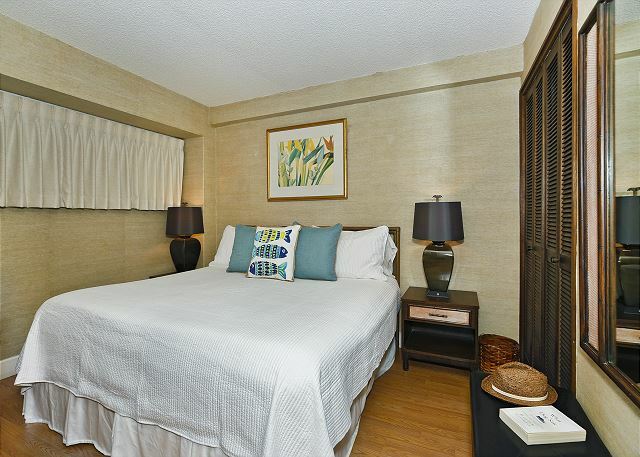 So glad to hear you enjoyed your visit to Waikiki and stay in this great condo! We look forward to your next visit! 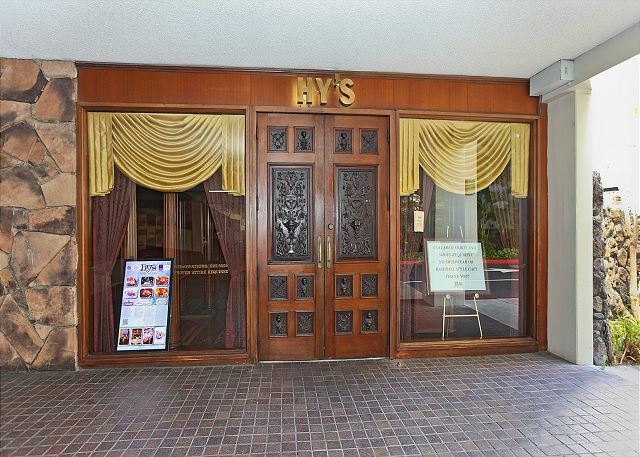 It was so centrally located and within walking distance of the heart of Waikiki. We were able to have early check in and Barbara was very helpful. Would highly recommend this unit. Aloha and Mahalo for the wonderful review! We are pleased that your stay was enjoyable and we exceeded your expectations! Thank you very much for the positive comments. It’s always encouraging when customers acknowledge the good work of our team. We look forward to seeing you again soon. A very nice clean condo apartment, with all the things you would need. A good view of the ocean. Friendly and patient management. Walking distance from all sorts of activities, and restaurants. Great location. Home had everything we needed. Comfortable! Close to everything we wanted to do. Great views. Comfortable home. It had everything we needed, even beach chairs and beach towels. Pool was nice as well. Was able to walk everywhere we wanted to go. Fantastic little condo with spectacular view of ocean. Super clean with all the necessities in the kitchen and unit. Beach towels, beach chairs and snorkeling equipment. The unit is in central Waikiki and close to everything including the food pantry. Barbara our contact meet us upon arrival and gave us the condo tour and responded to any questions we had thru our 2 week stay. We would definitely stay here again. Aloha and mahalo for taking the time to post a 5 star review and recommendation of this fantastic condo. We're delighted your enjoyed your stay! It makes our day to know our dedicated staff was able to make your vacation a wonderful experience. We look forward to welcoming you back in the near future. We needed a place with a kitchen, bedroom, living area and a balcony.This place was nice. Kind of small but met our needs for the 3 days we wanted to get acclimated after a 10 hour flight and a 6 hour time zone change. The bathroom did not have a door but did have a curtain to close for privacy. It was in a great area with access to Waikiki Beach and day and evening activities. Mahalo for your time and input. We look forward to welcoming you back in the near future. Cute condo, close to the beach, shops and restaurants. Perfect for 2 people! Aloha and mahalo for taking the time to post a review and recommendation of this fabulous condo. We're glad you enjoyed your stay! Hope to see you on your next visit to Waikiki! Everything about this condo was wonderful. I've stayed in these types of places all over the world, and this was by far the best equipped I've seen. The kitchen had everything we needed to cook, we had beach towels and beach chairs (as advertised), and there was even three sets of snorkeling gear to use. It had everything we needed, and more! I did a ton of research prior to renting this unit, and if you are looking for the best combo of price, location, and amenities, this is is. 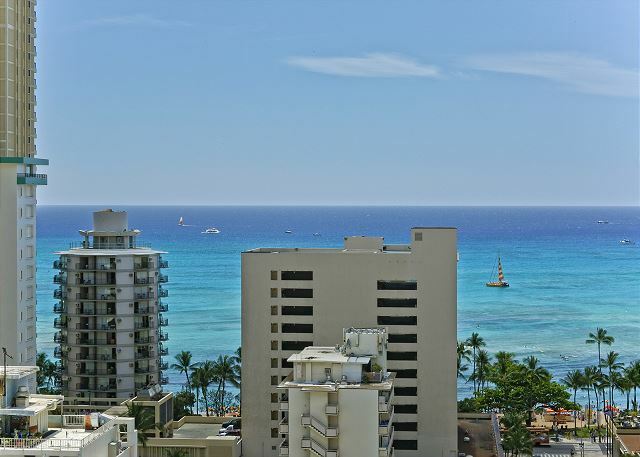 The beach view from 1806 is amazing, it's right in the heart of Waikiki, has a wonderful king-sized bed, etc., etc. Based on what I saw, this unit was several hundred dollars cheaper for a week's stay for comparably-sized units. Our contact Barbara was helpful and professional, and really bailed us out when I lost our keys when we were out one night. She lives in the building, and was able to let us in after ten pm in just a few minutes. Unbelievable! When I return to Waikiki, there is no doubt I'll come back to this condo! Aloha and mahalo for taking the time to post such a great detailed 5 star review and recommendation. We're delighted you enjoyed your stay in this fabulous condo! It makes our day to know our dedicated staff was able to make your vacation from start to finish a wonderful experience. We look forward to welcoming you back in the near future. The condo is well location and clean. Good place to stay in Waikiki. Mahalo for the fantastic review. We are so pleased you appreciated the convenient location of this great condo! We look forward to seeing you on your next visit! Cute 1 bedroom condo with a great view! I only was in the place for sleeping, and mostly out and about during the day. Perfect location if you want to walk around and explore the town or just go lay at the beach. It was only a 5 minute walk to the beach. I loved how they provided chairs and towels in the room to use. I would definitely come back! Mahalo, Jennifer, for the lovely review! We're so glad you enjoyed your stay and pleased that you took advantage of the beach chairs and towels! We look forward to seeing you on your next visit! The condo was very comfortable with more than enough appliances towels bedding furniture & it even had beach towels & beach chairs. If there was any negative point it would be the bathroom which was a strange design and needed updating, but overall it was in a great location within walking distance to everything. Our rental experience was excellent. The unit was clean and offered everything we needed. Barbara was wonderful and ensured we had everything we needed. Aloha Deb! Thanks so much for leaving such a great review. Happy to have provided all of the needs you required for a wonderful vacation! It's what we're here for! Hope you can enjoy a return trip to our beautiful islands soon! Nice condo in excellent location. We really liket this little condo. IT had all you can wish for a stay for 2 adults in Waikiki. Mahalo Oloph for the 5 star review and recommendation! We hope your future travels do include another visit! See you then! The location was perfect. Loved the ocean view from the private lanai. I was there for a month and will try to book this apartment on my next visit. Had a great stay. The condo was all we expected. 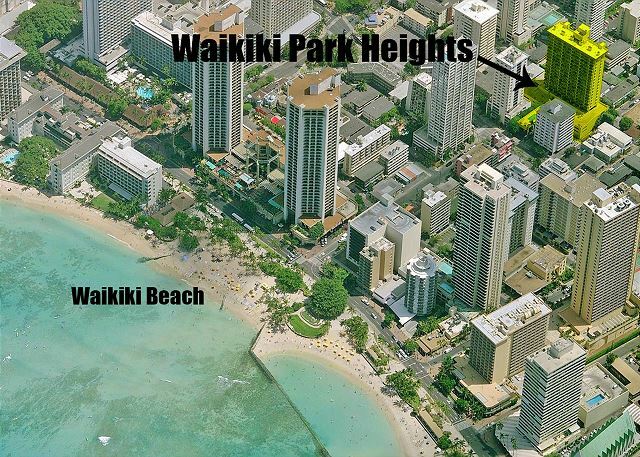 Waikiki Park Heights is centrally located to everything Waikiki has to offer - it is all within walking distance. The view from #1806 is magnificent and the balcony provides the perfect place to have breakfast! We had the sofa bed open for our entire stay and there was still plenty of room to get around the kitchen area. Barbara was so lovely and helpful. Thanks for the great review, Tania! We appreciate the feedback! The unit we had booked when we arrived did not meet our expectations; however, Captain Cook Resorts provided a short term answer and after only 2 nights we were able to shift into the unit we spent the remainder of our two weeks holiday in. Captain Cook Resorts were awesome to deal with and our overall experience was not negatively impacted at all. Mahalo, Fiona! We appreciate your feedback - and so happy everything worked out so well for you all! Give us a call when you're ready to book another visit! Great location, close to the beach. Very clean, and close to everything. Unit is very small but has everything that was is needed. Beautiful view of the ocean as well. Mahalo, DuJuan! We hope you are able to plan a return visit soon! As good as you hoped! Great location and a very easy walk to the beach, shops and restaurants. The view was exactly like this pic and I'd eagerly open the curtains each morning to check the ocean. The apartment was just as described and I'd happily stay here again. Mahalo, Sharon! That's just what we love to hear and we appreciate the feedback! Hope you can join us again sometime! 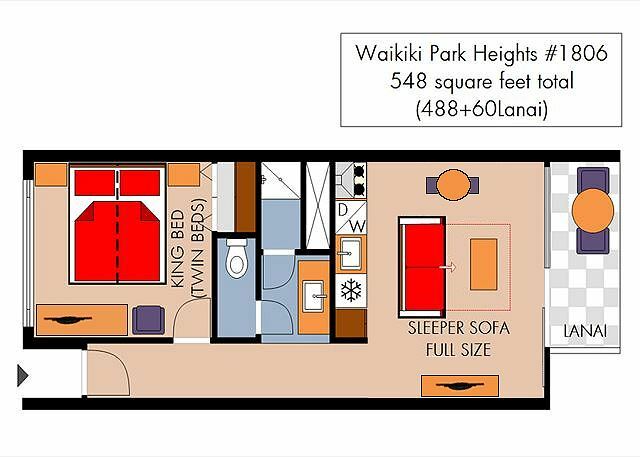 Condo 1806 at the Waikiki Park Heights is a perfect location at Waikiki. The unit itself is small, but three adults stayed there comfortably enough. The sofa bed, not too comfortable. It was a lot of work to pull it out, having to re-arrange things in the living room to do so, so we just left it out for the three and a half days we stayed. 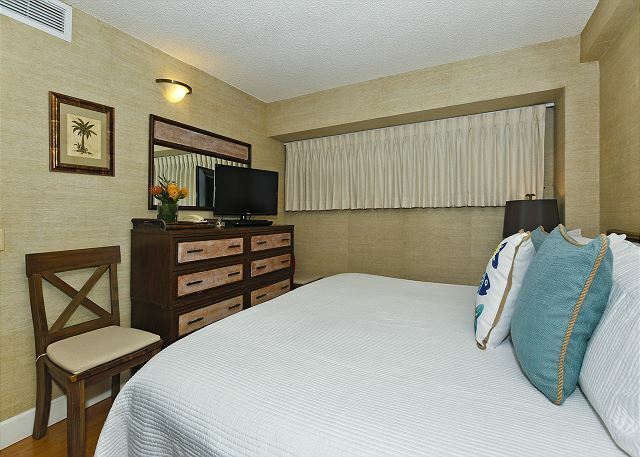 The bedroom is very nice - with a King Size bed, plenty of closet space, and dresser, and a flat screen TV. The kitchenette was perfect, there was a nice size table and chairs to eat at, and the balcony was perfect. We would definitely stay there again in this unit, if it were just two of us. But the building is a perfect location. Us arriving at the building should not be based on our flight arrival. Although our plane landed at 1:30, it took us close to 2pm to disembark, then get to the rental shuttle and arrived to the rental car place at 3pm, and stood in a long line out the door. Since we were told to only contact Barbara when we were on our way to the condo, I held back on calling her. By the time we were in the car I noticed we had two missed calls from her. So that stressed me out a little. But it all worked out. She was very kind and helpful, even bringing me a fan to sleep with. Of note, the bathroom is very small. The vanity/shower entrance has no door (the toilet does) so there is a curtain you unhook for privacy, however, it's not quite wide enough. So, my guys had to stay in the living room while I got out of the shower. Mahalo for the great review, Steve - we appreciate the feedback! Mahalo for the great review and recommendation! We will look forward to your next visit! Best Place to Stay in Waikiki! Let me start off by saying Barbara was a very friendly host and gave us a warm welcome to our home for the week. The location of this place is absolute perfection!! It's off the busy main strip but literally a 5 minute walk to the beach, shops and restaurants. You can't beat that. The apartment itself was clean, well furnished and the ocean view was amazing! Ate breakfast out on the patio every morning. Kitchen - well equipped to cook anything you want. I felt very safe with the friendly security guards in the lobby at all times. I was very happy with my decision to stay here - if you're looking for value, this is the place. Don't pay $250+ for a hotel when you can stay here for less than half the price. I feel like you get way more for what you pay here. I would 100% stay here again! Mahalo Cheryl, for the great review and recommendation! It's always great to get this kind of feedback - we're so glad you enjoyed your stay! We will pass your feedback onto your property manager, Barbara; she's a real asset to the Captain Cook Resorts team! Such a great condo for the money I have paid close to 200 dollars at hotels which barely had any amenities. This condo has a full kitchen with modern appliances. Everything you need to cook a good meal. It's a block away from the Duke Statue. The security there was great and extremely friendly. Me and my fiance really were blown away by the service capt cook resorts provided. Our flight was delayed numerous times we were supposed to be in t 9pm we didn't arrive till 330 and didn't get into waikiki till 4 30 am but the property manager who works for capt cook stayed up all night to make sure we didn't have to sleep in our rental car first night. We will definitely stay here again. Mahalo, Andrew, for the positive comments. We work hard to offer great accommodations and service, and we're so glad your visit was enjoyable. I will pass your feedback on to the team, and we shall look forward to seeing you and your fiance again soon! 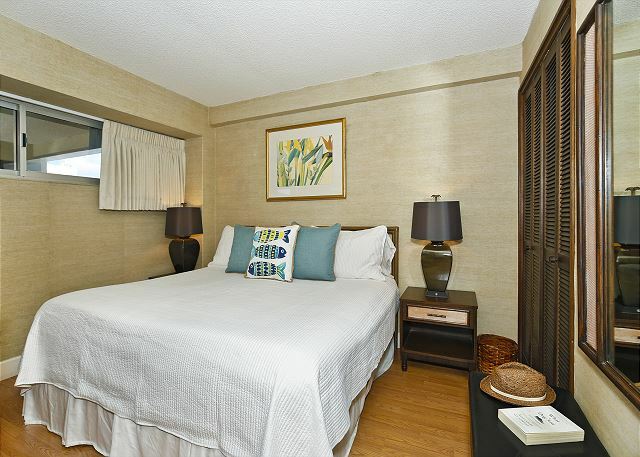 Unit #1806 is an easy 2 block walk to the center of Waikiki Beach. Our unit's lanai overlooked the ocean. The bus stops right outside the main entrance. The building is extremely quiet and mostly filled with retirees. The pool is clean and nice. There is a food pantry grocery store about 3 blocks away where we did shopping. There are endless choices for restaurants and bars all within easy walking distance. The unit has a small, but adequate kitchenette with a cook top, convection oven/micro combo and full fridge. It has adequate supplies. I appreciated the tile floor as I suffer from allergies, however I was disappointed in some of the cleanliness of the unit. I noticed that there was some mold around the door of the shower unit and quite a bit of dust covering the light fixtures and bathroom fans. I also noticed a thick layer of dust on the back of the bed frame. The tub tile looked stained and dingy. I thought the pillows could be replaced, as they appeared soiled and dingy. The towels and linens appeared clean and fresh. I would stay in the unit again, but would feel better if it had a "deep clean". Overall, with some minor tweaks, this place is a safe bet and the location wins out. Mahalo for posting a review of your recent stay and for alerting us of these issues. Our goal is to do all we can to earn your repeat business. By chance did you notify your property manager of these items during your stay? We hope so. We stand by our tagline: "If you’re not satisfied with your accommodations, please let us know right away so we can make it right!" I'm going back next year! Mahalo for your thoughtful review! We really appreciate your comments and were glad to hear everyone helped out while the elevators were being repaired. We'll be sure to pass on your comments to Barbara, the property manager, and hope to see you again on your next visit! We have enjoyed our accommodations with Captain Cook Resorts @ Waikiki Park Heights #1806 for several years now!! Close to the beach & any shopping or sight seeing you wish to enjoy! The units are fully stocked with all you would need on a daily basis. The view is spectacular and close to the beach, 24 hr fitness and delicious meals. 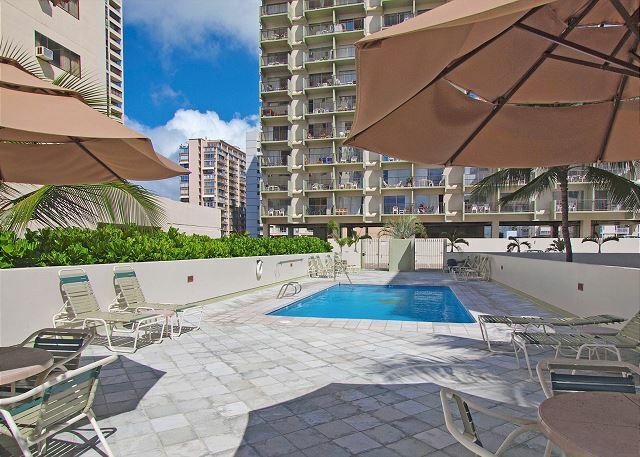 Very clean, convenient to everything in Waikiki, the sale representative and security were friendly. 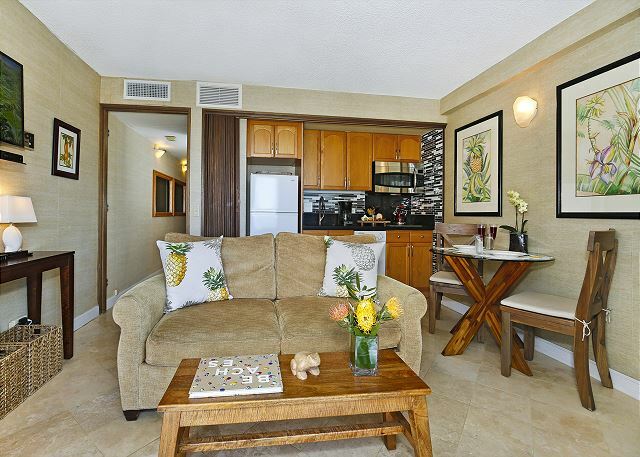 The condo had everything and so much more to make my stay in Waikiki very comfortable, safe and enjoyable! Thank you so much and when I return to Hawaii I look forward to staying with you again! As we have been at the Waikiki Park Heights for 12 consecutive years, no further comment is necessay. We were a little unhappy with the noise and water service interruptions from the renos on the floor above us this year. Great location only a few blocks from the beach. The unit is clean and has beach chairs and a nice view. Awesome Condo, Perfect Location, Great Views!! We thoroughly enjoyed our stay at the Waikiki Park Heights Condos. Very conveniently located to everything in Waikiki. Unless U absolutely need one for your own preference, U don't even need to rent a car. Everything is close and if U decide to do Hanauma, PCC, or a Luau, U can catch "The Bus" and it'll take U literally anywhere U wanna go. Condo itself was very nice with beautiful views of everything, ocean side or mountain side, U can see it from your lanai or right out your front door. I would stay here again in a heartbeat!! Mahalo Captain Cook staff, U made our trip a great time!! I really enjoyed my stay and am looking forward to my return next year to the same property. The view is amazing with the unit being fully stocked to a cookers delight, along with beach gear if needed. Being so close to the water makes for a short walk to the best BEACH in Waikiki. Barbara is a delight to work with and is available if anything is needed. Very clean, great location to shopping stores/ places to eat, quiet, comfortable and relaxing, close to the beach. The best part was the view- FANTASTIC!!!! I think there are definately pros and cons with this location. I love the location of the condo as it is closed to everything. The place is clean and simple and has AC so feels great when we are staying. However, the only challenges we had was the fact that we have to call to check in. Our flight was delayed and so it was 3 am and with no phone/wifi access, it was definately a challenge. Also, the towels are just provided to us and we had to do our own laundry... Lastly, the late check in fee of $20 was something I wasn't quite happy about... but still a good place if you want to go to places near by. We were put in touch with the rental agent for Captain Cook Vacations by a colleague who owns in the building. Front initial contact to the finish she was extremely professional and helpful. The location only two blocks from the beach was excellent. The suite had a good view, was clean and comfortable and the pool and laundry were very convenient. The building staff were also very friendly and helpful. We would definitely stay there again. Looking to experience excellence in your holiday accomodation? Its a great location, comfortable cozy clean and economical. Park Heights is a great place to vacation. It was very clean and had everything that we needed, and in a perfect location. I would not hesitate to stay there again and highly recommend it to others, just as it was recommended to us. Great condo!!! Will definitely stay again !!! We thoroughly enjoyed staying at Park Heights. Great View from the balcony. Good location. Quiet, even though you were so close to the beach etc. We have already recommended this property to friends and clients. I truly enjoyed my stay in this condo. The last six years have been wonderful.